Washington : US Secretary of State Mike Pompeo has announced that 16 Saudis, including one of the closest aides to Crown Prince Mohammed bin Salman, were barred from entry to Washington over their role in the murder of journalist Jamal Khashoggi. The public designations mean that the individuals and their families cannot enter the US under Section 7031(c) of the Department of State, Foreign Operations and Related Programs Appropriations Act of 2019, a statement issued by Pompeo said on Monday. The section “provides that, in cases where the Secretary of State has credible information that officials of foreign governments have been involved in significant corruption or gross violations of human rights, those individuals and their immediate family members are ineligible for entry into the US”, the statement read. “The law requires the Secretary of State to publicly or privately designate such officials and their immediate family members,” it said. 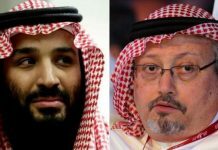 The list includes the Crown Prince’s close aide, Saud al-Qahtani, who officially served as the royal court’s media czar, but appeared to have overseen the operation to seize Khashoggi, a Washington Post journalist who lived in Virginia, The New York Times reported. It was one of a dozen or so operations by what American intelligence officials called the Saudi Rapid Intervention Group, set up by al-Qahtani to silence or eliminate dissent about Prince Mohammed’s rapid rise to become the de facto Saudi leader. Monday evening’s list also included several members of the team sent to Istanbul, where Khashoggi was killed on October 2, 2018, at the Saudi Consulate in an encounter that the Saudis insist was intended to forcibly bring him back to Riyadh. Featuring on it is the leader of that team, Maher Abdulaziz Mutreb, an intelligence officer who knew Khashoggi from their days working together at the Saudi Embassy in London. Also listed was Salah Tubaigy, whom The Washington Post recently identified as a “medical specialist” for the Saudi Interior Ministry who is said to have administered a powerful sedative to Khashoggi during a struggle inside the consulate. He died shortly thereafter and the body, which was cut up, has never been recovered. Much of the evidence against the men named in the State Department’s list came from Turkey, which had surveillance videos outside the consulate and had apparently bugged the consulate itself, resulting in an audio recording of the killing.